he COP23 was my first Conference of the Parties; an exhausting yet amazing experience. Two weeks of being in a bubble of climate talks felt like time had stopped, with nothing else on my mind but the COP even days after. I felt part of something big, and yet, I was conscious of the fact that maybe the rest of the world (my own circle of friends and family included) didn’t really care that much. I remember being a little disappointed in the morning, because there was not as munch press coverage as I would have thought, or because my own article or tweets didn’t go viral overnight. But, for two weeks, I was there, and it felt like a rollercoaster ride. Every day I would listen to and meet with the most inspiring people I have ever met, people who suffer from, and therefore fight climate change on the ground, in their communities, every day of every year. I met in Bonn the most inspiring men and women, and some incredible young people (younger than me! ), who have already decided to dedicate their lives to protecting the environment. I have some wonderful memories of the open discussions in diverse settings. I have travelled quite a bit, and lived in different cities in Europe and North America, but in Bonn I talked to people from every corner of the world, people from very different backgrounds and cultures. People I would have never meet in Berlin, London, Paris or Denver. But, there is a bitter taste left in your mouth after so many intense climate talks. Every day something was bringing my state of mind from excitement to something closer to depression. I listened to Brazilian activists whose peers have been killed by their own government for protesting against fossil fuels. I listened to experts from the scientific community who were convinced that our governments do not understand the scope of the problem. I was starting to realise that despite the importance of the Paris Agreement, it was certainly not going far enough. And I was getting quite upset listening to the politicians who were delivering talks that, in my opinion, certainly didn’t show much belief in themselves. I kept this frustration with me, and decided to spend some time with one of the most famous climate scientists, and one who criticises his own government for not acting on climate change. 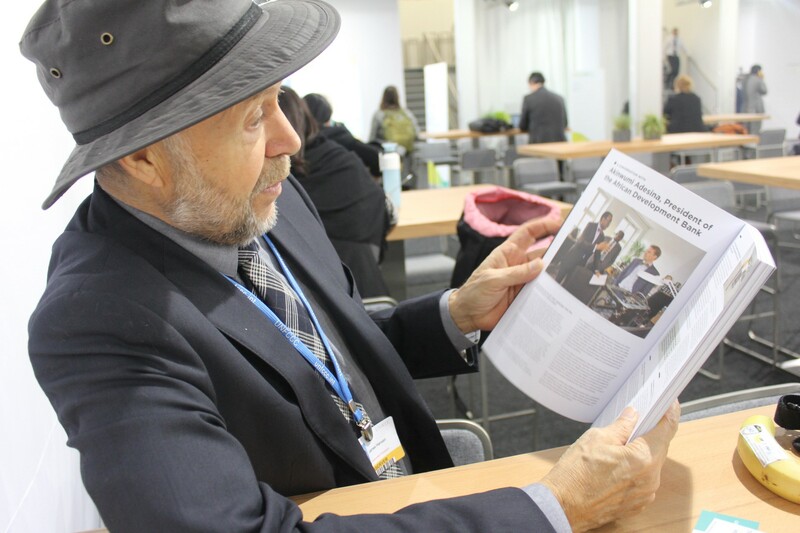 Here, my one-on-one with James Hansen, often dubbed as ‘the father of climate change awareness’. James, I’m really happy to meet with you here at COP23, thank you so much for your time. Let’s start at the beginning, and your congressional testimony on climate change in 1988 where you first introduced the problem of rising greenhouse gas emissions. What do you think has changed since then? Are people more aware today about climate change than in 1988? It’s quite interesting what’s happened since then. When I testified in 1988 and 1989, the reaction of the scientific community was not very positive. There was even an article in Science, titled “Hansen versus the world”. Scientists didn’t want to agree with what I had said, that greenhouse gases were already affecting the climate at that time. But just a few years later, in 1992, the United Nations Framework Convention on Climate Change (UNFCCC) was adopted by virtually the whole world, including the U.S. That was actually quite remarkable. Even President George Bush, a conservative Republican signed in, partly because he was pressured by bad publicity, and part of that was related to the fact that his administration censored my testimony to Congress in 1989. So that put a little pressure on him to actually attend climate meetings that were going to occur that year in Europe. Those meetings then went to further meetings and to the Rio conference in 1992. However, unlike the ozone problem — where the ozone hole led to the Montreal protocol and very effective actions, specifically to phase out those chemicals causing the problem — the climate problem is not being solved at all. There was absolutely no change — due to the Framework Convention on Climate Change and the Kyoto Protocol — to the emissions timeline of the developed world, which at its peak, reached its current value in 1980, and it’s just been constant since then. In the last few years, there was a couple percent decrease. But those decreases which have occurred in Europe and few other places have been almost balanced out by increasing air traffic which is not counted in these national totals. So, in the developed world, the emissions have actually continued to increase, exactly on the line, that were not affected by the UNFCCC. Partly because of a trick that occurs in this process where anti nuclear forces, and Germany in particular, excluded nuclear power as a clean development mechanism. That certainly did not help. But the problem with nuclear is that there is a lot of blame to go around including blame that goes on to the nuclear industry. But, in any case, as long as fossil fuels are allowed to be the cheapest energy, then all of these meetings do very little good. Until the countries, the United Nations and the big economic powers stand up and face the truth, we can’t solve the problem. In the United States or the European Union or China, someone needs to say: “Yes, we are going to have a rising carbon fee.” And the most likely possibility seems to be China. Because the European Union is still tricking itself to say this emission trading scheme can be fixed. Well, even if they fix it, what good does that do? It’s the global emissions that counts not just the European emissions. And how then, are you going to persuade everyone to have a European emission trading scheme? It’s a very ineffectual way to reduce emissions. You said scientists should be standing up and telling the public and the negotiators that they need to do something that has a real impact. Is that why you engaged in activism? What do you think activism brings that science doesn’t? It depends on what you mean by activism. I got dragged into this. After I testified in the 1980s, there were all these negative reactions so I decided I will focus on my research, and for 15 years I didn’t do any interviews, I just worked on the science. But by the middle of the second Bush administration, (the younger Bush), it was very clear nothing was happening. I just wanted to give one talk in which I was going to suggest that people vote for John Kerry rather than Bush in 2004. But then, the Bush administration got angry at me. They asked NASA headquarters to shut me up. When the media wanted to talk to me, NASA headquarters public affairs office would substitute somebody else. I let them do it for a few weeks, but then that got me sufficiently annoyed that I informed the New York Times. Still, I would have stopped at that point, except that, you know by that time I had several grandchildren and I didn’t want them to say that grandpa understood what was happening and he never made it clear. I was also asked to give a talk at Virginia Tech, which is in the place where they are doing mountaintop removal mining. The students who picked me up at the airport asked me to meet with Larry Gibson, an environmentalist who refused to sell his cabin on Kayford Mountain, which blocked the coal companies from removing the top of that mountain. So, I agreed to go to a protest and that was my first arrest. I have been arrested five times, every time in the U.S. But I’m skeptical about the value of getting arrested. I now have to go to testify on behalf of some people who turned off the tar sands pipeline. I went to go to North Dakota and the judge wouldn’t let me testify, saying the necessity defence is not allowed as they were not doing something that’s necessary. I would rather be on the offence, that’s what we’re trying to do with the lawsuit against the Trump administration and we’re proposing a lawsuit against the fossil fuel industry. How is it going with the lawsuit against the Trump administration? I think that now it’s pretty clear to me that we should win. First of all, we were confident we would win in Oregon. The judges had already looked at the request of the Federal Government and the so-called interveners, which were the National Manufacturers Association, the American Fuel & Petrochemical Manufacturers, and the American Petroleum Institute, who asked the judges to dismiss the case, and they would not. They said there is good grant for this, and we thought that the judges were quite deceitful in our favour. But then of course it would get appealed, and the Trump administration has made a really unusual manoeuvre, asking the Court of Appeals to intervene before the trial was heard at the District Court level. It’s a petition ordering the lower court not to proceed. In fact, all they could really do is delay the trial by three or four months, but I think we will win. Now the question is can we win at the conservative Supreme Court level and I think we can, because the constitutional basis is so clear. This is our second lawsuit, the first one we did lose at the District of Columbia District Court, which is a level below the Supreme Court, but it’s the most famous and the most influential of all the District Courts. At that time our case was based mainly on what’s called the public trust concept, that there is an obligation of the present adult generation to the coming generations. That’s not explicitly in the Constitution, it’s a common law and it exists in the British law, in Roman law, and in the U.S. at least on the state level, but it’s not in the Constitution. So in effect when the DC District Court decided against us, the words that the judges wrote actually encouraged us. We know we would have a much better chance if we show more clearly the constitutional basis and equal protection of laws. People can not be deprived of life, liberty or property without due process of law, and that is what is happening. It’s an allegiance to civil rights, so now the new case is more firmly grounded on the Constitution. Do you think Trump’s election and withdrawal from the Paris agreement can help create a grassroot movement in the U.S. to fight climate change? Does it have an effect on civil society? One thing it does is that it makes it much easier for us to win our lawsuit. Because Obama could claim that he was progressing things, but he hasn’t done much. U.S. emissions were going down a bit, but you have to go down several percent a year, which was not happening. Obama was approving pipelines, approving drilling, and he was not stopping mountaintop removal. You know, he took these little actions to try to make it difficult for mountaintop removal — but not really stop it. So, in that sense it’s easier to win our lawsuit, but the concern about the public, about Trump, it’s not so much about the climate; it’s other things that people are more scared about, like a war. In our paper Young People’s Burden, we assume that the emissions are going to begin to decrease rapidly in 2021, partly because we’re going to have a new president by that time, and because our lawsuit is probably going to get appealed. I didn’t want to say “we’re going to defend scenarios that assume that emissions were going to decrease rapidly in 2017 or 2018”, because it was probably not going to happen. But we still show that you could. It’s harder compared to if we had started in 2013. We now have to get 250 Gigatons out of the atmosphere instead of 100 Gigatons if we want to get back to 350 parts per million. So it’s harder and that mean you’ll have a little more additional warming that we wouldn’t have got if we had started eight years earlier. Absolutely, that’s why this all problem is a tragedy. It’s not only feasible, if you do it in the smart way, it doesn’t cost anything. You know, usually what the advocate of actions will say is that it is only going to cost one-tenth or 1% of your GNP or something. But it doesn’t have to cost anything. The economic studies shows, and it makes sense, that it doesn’t cost anything because an economy is more efficient if prices are honest. Right now, they are not honest. Fossil fuel still have to pay their cost. If you include those cost in the price of the fuel then the economy becomes efficient. But you can’t suddenly double the price, instead you do it gradually so that the market can help you find those solutions, which are more economically efficient. You often raise the problem of policymakers’ climate inaction. What does it take to get there? What do we need? Are you optimistic about young people coming into politics and making a real change? The reason why I’m reasonably optimistic is that the organisation Carbon Fee and Dividend has a single objective. They are more than 90,000 members, most of them older people, retired people who have the time to call their senators, call their representatives, write Op-Eds and visit Washington, and it’s been growing rapidly. It’s about a decade old now and it’s still growing. It’s actually now got pretty big in Canada as well. Canada is another example. They elected this young guy Trudeau, who’s again like Obama, says the right words but he’s working with the fossil fuel industry. I mean, nobody said it’s gonna be easy but it’s worth the effort, we’ve only got one planet. What do you think of the Paris Agreement? The Paris Agreement per se is useful but only if the countries recognise that this doesn’t really do anything, it doesn’t actually reduce emissions. But it is useful for all the country to say “yeah, we agree, there is a problem, we need to do something”. So that is useful. But it’s not the actions that are needed. There needs to be an agreement that the price of fossil fuel has to rise across the board or we’ll never get rid of them. Fossil fuels are very convenient, that’s why we use them, that’s how the world moved out of the Middle Ages. I mean, we discovered this amazingly condensed energy that we could burn and every person now has the equivalent of a couple of dozens slaves, that’s how they can drive their vehicles, and can have this energy in their homes, and it raised the standard of living. But it’s come at a cost and we’d like to have an energy without the cost. And that requires making that dirty energies more expensive. Thank you so much for your time! Good luck with the trials and see you next year at COP!